I have to admit, I am getting concerned about the Ebola crisis. The news of health and aide workers contracting the disease and eventually bringing it to their homeland only make me more afraid that it's only a matter of time before the disease reaches our country. If that happens, it will be another major crisis for our country. At one point I wanted to run to the nearest health store and stock on face masks, hand sanitizers and wet tissues to protect myself. However, I decided to check first for information on the disease from the World Health Organization (WHO) and the Center for Disease Control (CDC) websites. The virus is transmitted to people from wild animals and spreads in the human population through human-to-human transmission. 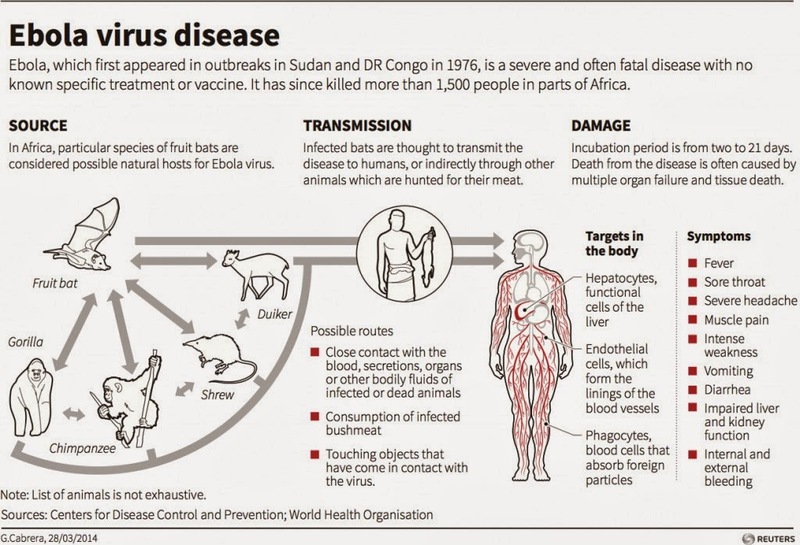 The initial source of past EVD outbreaks was likely human contact with wild animals through hunting, butchering and preparing meat from infected wild animals (“bush meat”), with subsequent transmission from human to human. Dr Bruce Aylward, the WHO assistant director-general, warned that the number of new cases was likely to be between 5,000 and 10,000 a week by early December. Their regular updates show that deaths have resulted from 4,447 of the 8,914 reported cases. Aylward added that any assumption that the death rate was 50% would be wrong. He put the death rate at 70% because many deaths are not reported or recorded officially. From the CDC Ebola website, I gathered that Ebola is transmitted by direct contact with body fluids of a person who has symptoms of Ebola disease and unlike respiratory illnesses like measles or chickenpox, which can be transmitted by virus particles that remain suspended in the air after an infected person coughs or sneezes. 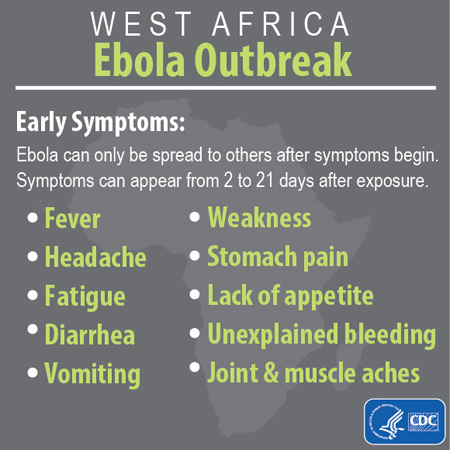 Also coughing and sneezing are not common symptoms of Ebola, however, if a patient with Ebola coughs or sneezes on someone, and saliva or mucus come into contact with that person’s eyes, nose or mouth, these fluids may transmit the disease. It is also NOT spread by water, or in general, by food. Moreover, the CDC website clarified that the EDV is killed with hospital-grade disinfectants (such as household bleach). Ebola on dried on surfaces such as doorknobs and countertops can survive for several hours but the virus in body fluids (such as blood) can survive up to several days at room temperature. Also, there is no evidence that mosquitos or other insects can transmit Ebola virus. Only mammals (for example, humans, bats, monkeys and apes) have shown the ability to spread and become infected with Ebola virus. Here's a useful infographic on the EDV with information mostly gathered from the CDC. It's not mine and I just got it from Google images but the information are very helpful in understanding this disease. Great post Wiggletoes on Ebola! It's funny: We just created an amazing Infographic on "Ebola Virus. What Is It? Interesting Facts" because we found people were missing the essential facts about Ebola.